The BMP-1 is a Soviet amphibious tracked infantry fighting vehicle. 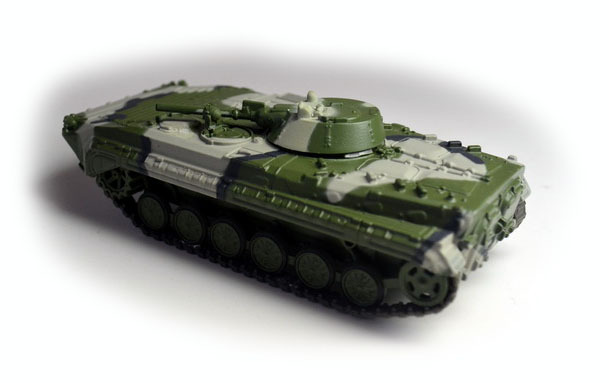 BMP stands for Boyevaya Mashina Pekhoty (Russian: Боевая Машина Пехоты), meaning "infantry fighting vehicle"). The BMP-1 was the world's first mass-produced infantry fighting vehicle (IFV). It was called the M-1967, BMP and BMP-76PB by NATO before its correct designation was known. The BMP-1 entered service with the Soviet Army in 1966. 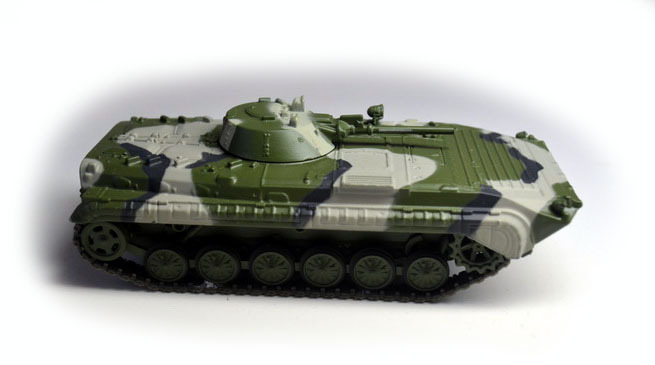 The BMP-1 was first seen by westerners during the 7 November 1967 military parade in Moscow. Its appearance created a stir in the West where lightly armed APCs were still the norm for transportation and infantry support on the battlefield. In the Soviet Army, BMP-1s were typically issued to motorized rifle divisions and the motorized rifle regiments of tank divisions, where they replaced the BTR-152, BTR-50P and some BTR-60P APCs. 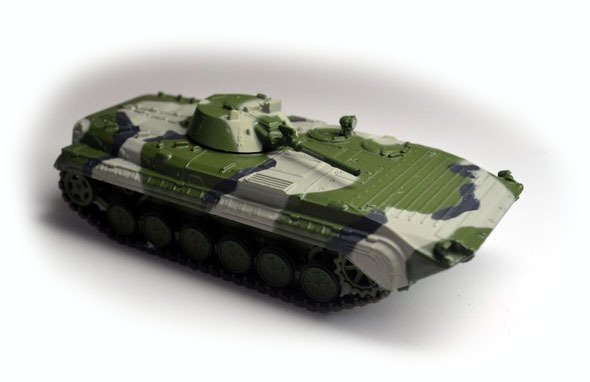 Currently, BMP-1s and vehicles based on it are used by the Russian Army and internal security troops of the Russian Ministry of Internal Affairs (MVD). BMP-1s were widely used in Afghanistan by motorized rifle and tank units. They were also operated by some special forces. Due to its lackluster performance, a new up-armored variant, designated the BMP-1D (the so-called 'Afghan' variant), was rushed into service in 1982. Many field modifications were made to their BMP-1s by various units. Other BMP operators have included Poland, Egypt, Syria, the People's Republic of China, Afghanistan, India, Iraq, Germany, Greece, and Sweden.